Italy’s fashion and economic capital, mile-a-minute Milano is a thrilling, energized place that blends its industrial know-how with a flair for style and zest for life. The result is a thoroughly modern metropolis that leans on the foundations of nearly 3,000 years of history. Come to Milan for wonderful art (Da Vinci’s “The Last Supper” hangs here), amazing architecture (the Gothic cathedral is the world’s largest), dining (Milan is a wealthy town that offers foodies a multitude of upmarket gourmet gems like Cracco Peck) and of course, fabulous shopping that showcases the work of some of the most creative minds in Europe. Browsing the boutiques selling beautiful leather goods, shoes, handbags, fashions, and antiques is, without doubt, a favorite activity in Milan. The stores here are among the most exclusive in the world; all major brands, Italian and international, vie for the attention of the privileged shoppers that descend on the city. Stroll along Via Montenapoleone or in the Galleria Vittorio Emanuele in the Piazza Duomo for tempting finds that will have you reaching for your credit card. After hitting the boutiques, the city’s cultural and historic sights await. Make a beeline for the looming Duomo, a storybook temple topped with 135 delicate-looking spires and smothered in adornments. By night, see an opera in the Teatro Alla Scala, one of the world’s most beloved opera houses. Founded in the 7th century BC Celtic tribes, the northern city became a Roman stronghold in 222 BC and soon became a hub of transportation and trade. It was named the capital of the Western Roman Empire in 293 AD. The city reached its peak of power in the 13th century when it led the Lombard League and was ruled by two wealthy families (the Visconti and Sforza). One of the leaders of the Italian Renaissance, Milan was a center for the arts and learning for centuries, and its power continues to the present day. Located on a vast plain in Lombardy, Milan enjoys wonderful wines and foods from across this northern Alpine-bordering region. The top wines found in Milanese restaurants come from DOCGs Franciacorta (fabulous bubbles), Valtellina Superiore (rich red wines) and Sforzato di Valtellina (delicious, heavy reds). Other wine regions nearby include the interesting Oltrepò Pavese. Lombardian dishes are often considered to be among the heartiest and heaviest in Italy. Rich in butter, cream, and cheese, the specialties are delicious and memorable, if not exactly for dieters. Excellent Lombard cheeses include the cow-and-goat cheese Bitto, the famed blue-veined Gorgonzola, creamy Mascarpone, and a Parmesan-like Grana Padano. Treated meats, like the tasty bresaola, air-cured beef, or speck (smoked bacon) are also popular in Milanese restaurants (although not strictly from Milan). Rice is even more popular than pasta in this part of Italy and risotto is ever present. 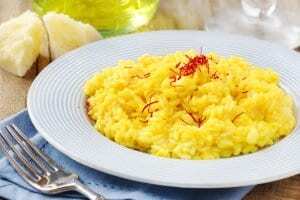 Risotto Milanese is Milan’s flagship dish, made with saffron. Ossobucco (braised veal shanks cooked in white wine), Cotoletta (breaded veal cutlets) and Panettone (breadlike Christmas cake made with candied fruits and raisins) are all specialties from Milan. Located in the Santa Maria Delle Grazie convent, this is many visitors’ first stop in Milan, especially since Dan Brown’s “The DaVinci Code” became a massive bestseller. Known in English as “The Last Supper”, Leonardo da Vinci’s masterpiece is the most famous painting in all Milan, if not all Italy. Dominating the central Piazza del Duomo and rising high above other buildings, Milan’s Duomo is the world’s largest Gothic Cathedral, with capacity for 40,000 people. Nearly 600 years were needed to build this mammoth church; construction was finally completed in the 19th century. You can head up to the roof to enjoy stellar city views. Just across from the Duomo, this beautiful shopping arcade dates back to the 1860s and is named after the King of that era. There are a marvelous glass ceiling and a multitude of shops and cafes. Considered the world’s most famous opera house, the decadent La Scala theatre near the Duomo stages productions from November to July and operagoers book months in advance. Once the residence of the ruling Sforza family, this opulent palace is now home to the Musei del Castello, a group of small museums dedicated to local art, music, archaeology, and decoration. A wonderful art center in Milan’s cutest neighborhood (Brera) boasting many important local works, the Pinacoteca is a must for art lovers.